To deliver better user experience, wanted to show a neatly designed thank you page on submitting a customized SharePoint list form in InfoPath. Although we can customize the standard popup message shown on successfully submissions through "Submit Options" under Data tab, we wanted to customize the entire look and feel. The idea is: Create a new view for Thank you page and then change the view after submitting data. 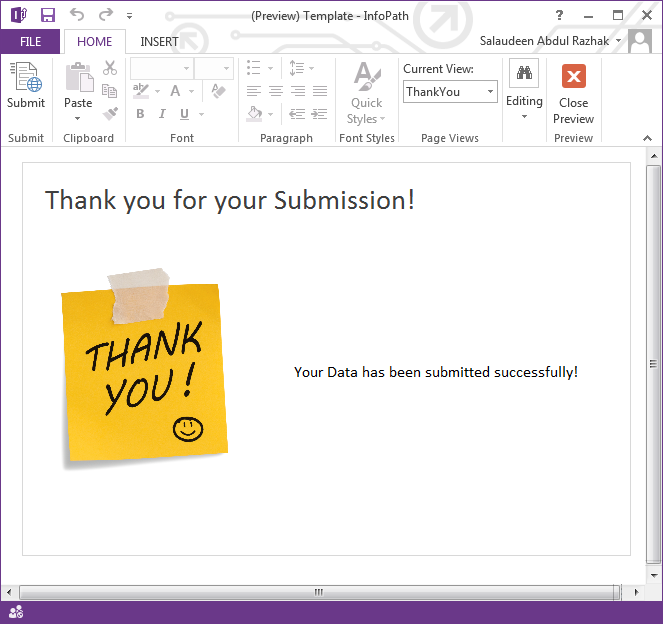 Here is how to implement thank you page for InfoPath forms. Click on "Page Design" tab and create new view. Create a button for "Submit". From the ribbon select "Manage Rules". In the "submit" button's Rules, Add >> and then Action. That's all! Now we let the end-user to know, form submitted successfully. How to Upload List Template in SharePoint 2013?